Can the Aachen Treaty revive Europe? Throughout the course of the past century, the relationship between France and Germany has undergone dramatic ups and downs, from hostility to one characterized by reconciliation and cooperation, and now, integration. On January 22, French and German government leaders signed a new friendship treaty in Aachen, an ancient city with a historical background shared by both countries. Observers described signing of the treaty as a historic moment. The signing marks yet another effort by the two countries to strengthen cooperation while announcing their determination to move forward on the path of integration. The treaty aims to counter the nationalistic trend in international relations, fueled by the "American First" campaign, and to promote transnational union construction and social integration. French President Emmanuel Macron and German Chancellor Angela Merkel hope the treaty will lead to the enhancement of EU cohesion and resist the offensive to the system from the rising tide of nationalism and populism, and also protect the EU public from external threats. The direction may be right and has the potential for institutional innovation, but the road is tortuous. The will is obvious, but the way is in darkness. For France and Germany, the treaty is one of the very few options left for them. Internationally, the EU has felt abandoned by the US, who traditionally plays the role of leader in the security alliance. Besides, the EU believes it is under great external pressure as its geo-security is threatened by Russia, its economic and institutional status challenged by a rising China, and additionally, with the refugee crisis. This situation calls for European countries to unite and respond in unison. Unfortunately, the progress of European integration has been repeatedly blocked. Even before losing confidence after the Brexit vote, EU member states were already knee deep in traditional political crises, many of whom were busy with their respective affairs. Consequently, the overall unity and coordination between EU countries have become increasingly difficult. France and Germany, as founders, leaders, and promoters, and also beneficiaries of European unification, do not want to see it fail. 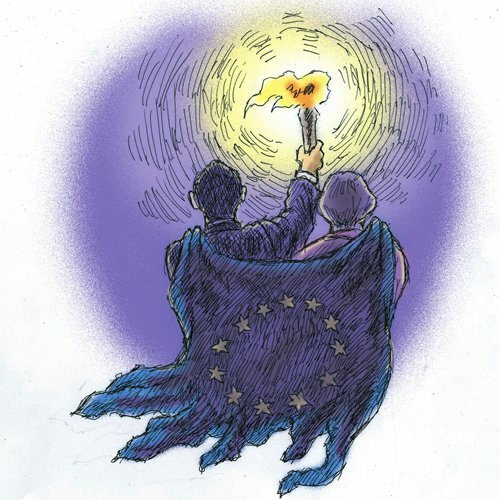 Despite persistent EU revitalization efforts, both leaders have not only achieved little in recent years but are faced with increased divergence and division. Under this condition, both have chosen to restart the "Core Europe" strategy, which means they need to come together first before Europe can unify. The strategy requires both of them to build a "common space" in political security, economic society and institutional organizations, so they can be role models for other nations to follow and motivate a new beginning for European integration. EU countries have expectations and concerns about the leadership initiatives and roles of France and Germany. In the eyes of many member states, France and Germany are the EU bosses and therefore in a position to boss around other countries. For instance, Germany once promoted the sharing of responsibilities among all the EU members regarding the refugee crisis, which has caused indignation against Germany across Europe. With France, the "Yellow Vest" movement spread throughout Europe, raising questions about the county's ability to take care of its own problems, let alone those of the EU. Moreover, the strengthening of the ties between France and Germany can be rendered as a loss of faith in EU integration and their own expressions of "Eurosceptism." In fact, in his speech at the signing ceremony of the Aachen Treaty, Donald Tusk, president of the European Council, cautioned Europe against "losing faith in Europe's integration as a whole." French and German leaders should be aware that even elite-led politics is built on public recognition and participation. Outside, where the Aachen Treaty was signed, many people wore yellow vests. Holding signs that read "Be Fair," "Reduce Rent," and "Macron Go," protesters voiced their dissatisfaction against elitist politicians who have turned a blind eye to the real social problems. French and German leaders know that the bloc needs to be more than a political project. It has to be widely accepted and participated in by European citizens. Without the joint efforts of the people, even the most significant idea amounts to nothing. The naivety of the political class might be the reason why EU integration has been so difficult recently. They are the ones who have pushed the public off the road to a united Europe. Macron and Merkel may have also realized this. Following a brief ceremony, they met the public, talking with representatives and young students at length and answered questions. This can be seen as an effort by the politicians to connect to the public, but the public needs solutions, not answers. The times have changed. The Aachen Treaty, signed in the capital during the Charlemagne Empire, is a reminder of the "Empire Dream." Coincidentally, the Charlemagne Empire, which was established through military expansion, consisted of present-day France and Germany. It is no longer an era of military dominance, at least not in Europe, and neither in France and Germany. Instead, today's world is defined by the competition of soft power. As Macron said, "Europe does not dream an empire dream" and "Europe does not need a supreme leader," making it clear that integration between France and Germany is not a step toward European hegemony. However, actions speak louder than words. France and Germany need to be role models to convince all Europeans. Merkel called for continuous mutual understanding, and not only through words but also in spirit and organization. The Aachen Treaty addressed these aspects by proposing measures to strengthen ties and coordination between the two countries, and not only with diplomacy and security, but also social affairs that are concerned with everyday life. A few examples include mutual recognition of secondary school degrees and establishing dual university programs. Such efforts within social system development can point the way toward the future for France and Germany, and Europe as a whole.